We have just finished a week of fun with Ivey and Grandmother. 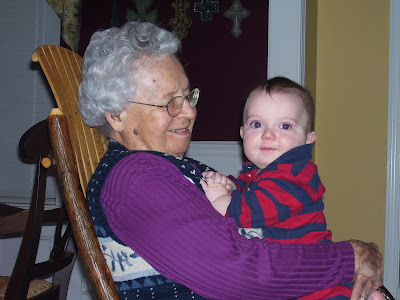 Ivey is my grandmother, 91, who has so much life in her. She reads to the boys, watches them run circles around her, takes occasional naps on the couch, sleeps on the couch at night (trooper), dodges swords, rocks and gives Tate a bottle, and this past time helped stick mailing labels on evelopes for Chad's mission trip to Mexico with the youth this summer. 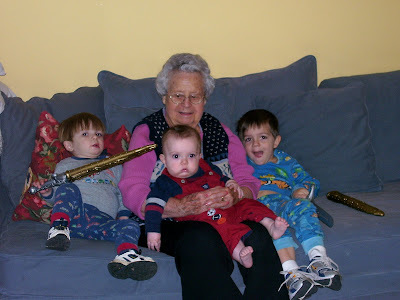 I'm so thankful that our boys are growing up knowing their great grandmother, and the value in family. I'm also thankful that she is willing and able to make the 10 hour trip in the car with my mom. That's one thing about Ivey, she doesn't want to miss anything and is always ready to ride; especially to visit the great grands! We love you Ivey.